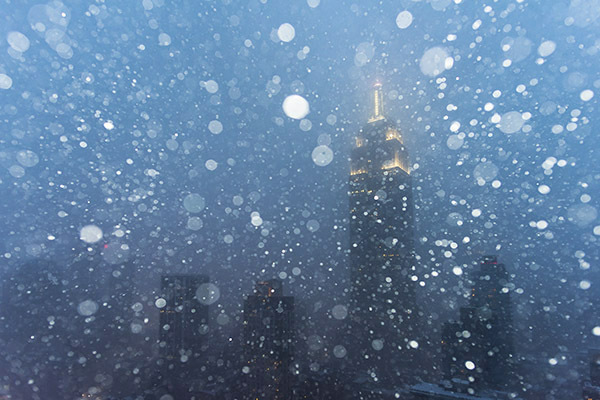 The first winter snow storm hit the east coast very early this morning. I began photographing it just after dawn when I was finally able to discern some shady outlines of the city through the snow and haze. My first shots were a little too dull so I put a Yongnuo flash on my Fuji X-T1 and took some photos with the Fuji 10-24mm zoom set to 10mm and f/4. After some experimenting I settled on 1/4 power for the flash achieve the right balance between the brightly lit falling snow flakes and the background scene. I liked that the colors were very subtle, almost Impressionistic, and the avenue below was softly lit with the glow from street lamps and the headlights from a lone taxi. This is my first photo of the weekend snow. 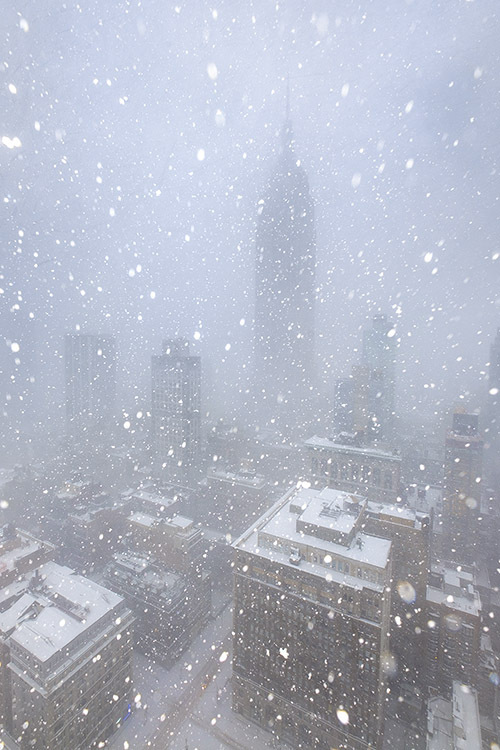 I'll be going out later to photograph the city as the snow continues. 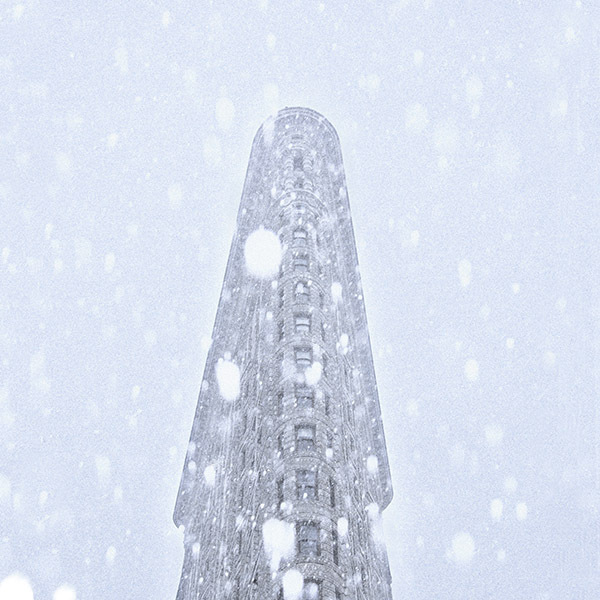 The Flatiron Building during the mid-day white-out. The snowstorm at dusk just as the city lights began coming on. The exposure can make a big difference in how the snow and background scene interrelate. For instance, the photo above taken with a 20mm was shot at f/2.8, 1/30 second, and ISO 400. Because of the shallow depth of field the aperture of f/2.8 made the foreground snowflakes larger. In the photo below taken at the same time the exposure was changed to f/8 and 1/4 second at ISO 400. Here the snowflakes are smaller because of the greater depth of field and the distant flakes are not lit because of the decrease in aperture exposure so the background scene comes in sharper. It is all a matter of experimenting to see what effect works best for what you want to achieve. Beautiful Pictures Tom! I was going through my old reference book "Photographic Composition" and was delighted to find your blog and to see you active on it. Very excited! Will do my best to keep engaged! 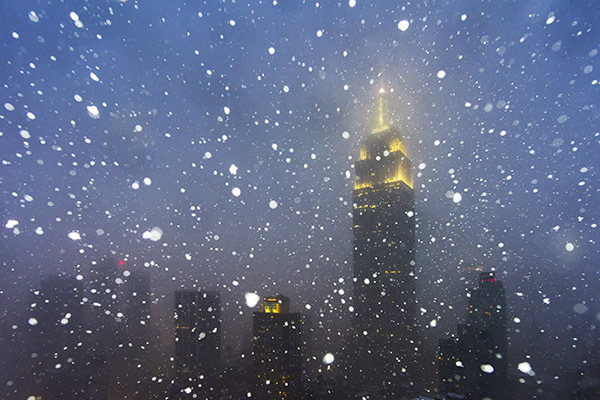 These photos are wonderful, they really capture the feeling of being in a snowstorm with the flakes flying every-which-way. I've always struggled with setting the flash right to highlight the flakes without underexposing the background, it's nice to see your technique. Yes, Lucas, the real trick is balancing the exposure of the flash with the daylight scene. It's a bit of a trial and error process. First determine the correct f/stop exposure for the flash on the snow. Let's say you settle on f/5.6 as giving the right amount of light on the flakes plus the right amount of depth of field. Next you pick a shutter speed that goes with f/5.6 and gives you what you want for a background exposure. Remember, the shutter speed doesn't affect the flash exposure unless you go above the sync speed. So you can go as slow as you want.